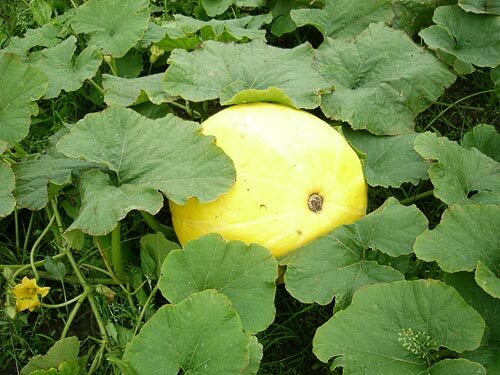 AgroAtlas - Crops - Cucurbita maxima Duch. - Winter squash. Cucurbita maxima Duch. - Winter squash. Grassy annual plant with creeping cylindrical staem till 10 m length, with branches 1, 2, 3-rd orders. The basic lateral branches are longer than the main stalk. The root system is strongly advanced. The main taproot may reach 1 m length; 10-12 horizontal lateral roots go from it on the depth of 20-40 cm and may reach 4-5 m. Leaves with long-leafstalk, alternate, smooth-margin or sinuate, pubescence in a various degree. Short tendrils mostly branched. Flowers large, yellow or orange color, more often unisex, single; but bisexual flowers can be also. The averige number of staminate flowers on a plant exceeds amount of female flowers at 20-25 time. Staminate flowers are located on the main stalk, and female flowers are more often on lateral branches. The staminate flower lives 1 day, and female flower if it was not fertilized, dries up next day after opening. It is pollinated by insects. Fruit - a multiseed false berry (melon), reaching the big sizes from 10-15 up to 40-50 (max 213) kg. Form: spherical or oblate; colour: white, grey, green, pink or red. The seed cavity partly or completely filled with placentae with seeds. Colouring of pulp from white and cream up to orange and red-yellow. Seeds up to 2 cm length, white, cream or yellow colour, oval. Weight of 1000 seeds is about 400 g. Seeds keep germinating capacity during 6-8 years. Widely cultivate in the centre of origin - in Mexico, Peru, Bolivia, Chile. In Russia it is cutivated from 16 century, and now it occupies almost all agricultural areas. The greatest areas under crops of species for territory of the USSR are in Northern Caucasus, the Volga region, Ukraine, and in Central-Chernozem regions. Thermophilic, heat resisting, drought-resistant, but also a moistureloving plant. It is requiring to light, does not bear shadowing and surplus of moisture. Cold-resistant, seeds sprout at temperature 12-15° C. Culture of short day. Optimum length of day 10-12 hours. Grows better on a virgin soil, long-fallow, middle-loamy soil. Table grades: Volzhskaja seraja 92, Stolovaja zimnjaja A-5; fodder grades: Krupnoplodnaja 1, Stofuntovaja etc. Vegetable and fodder culture. The pulp of fruits of separate grades contains 4.3-7.8 up to 15 % of sugar and up to 40 mg/100 g carotin, 16 % starch, 25 % protein. The pumpkin is vitamin-rich by B1, B2, B6, E, PP, an ascorbic acid up to 20 mg, pectinaceous substances, amino acids.Seeds contain 36-52.2 % food oil. Productivity 30-50 ton per hectare, up to 100 ton per hectare at watering. Belik V.F. Melon growing cultures. M. 1975. 270 p.
Mamonov E.V. The grades catalogue. Vegetable cultures. Moscow. 2001, 496 p.
The world of cultural plants. The directory. Ed. by V.D. Baranov, G.V. Ustimenko. Moscow. 1994, 381 p.
Zhukovskij P.M. Cultural plants and their relatives. Leningrad, 1971, 752 p.
© Lomova E.I., Terekhina N.V.